Soon, the app will include exclusive ticket access, augmented reality, an enhanced #EduHam experience, and interactive karaoke tracks. Mr. Seller states, "We are constantly exploring ways to allow more people to experience Hamilton in its many forms. This mobile app is designed to do just that -- provide exciting new ways for fans to interact with and gain access to the musical they love." Creator Lin-Manuel Miranda states, "With the roll out of the HamApp, we are setting the stage, but it's just the opening number. There is a lot more to this app that's on the way, and I'm very excited to share it all with our fans in the coming months. Get ready for what's next!" The #Ham4Ham lottery, where fans can enter to win two tickets to HAMILTON for only $10 each, is now even easier to enter using the app. The app-based lottery is now available for the national tour in Los Angeles, and will be available in New York on August 22 and Chicago on August 29. For details and to enter the lottery online, visit HamiltonBroadway.com/Lottery. Bring HAMILTON into all of your conversations! Chat with your friends using specially designed lyric stickers and HAMILTON emojis. Browse #HamArt stickers featuring the work of fans across the globe and submit your own for a chance to be included in future app sticker packs. Transform yourself into your favorite Schuyler sister, tell your friends you're in the room where it happens, and become the ten-dollar founding father. The #HamCam gives fans unique filters to create one-of-a-kind HAMILTON photos. Amaze and astonish with exclusive merchandise only available in the app! Get access to apparel, souvenirs, and the ability to download or stream the Grammy Award-winning cast recording and the Hamilton Mixtape. Be the first to hear about new blocks of tickets, go backstage before the show, read articles written by the cast and creative team, and watch exclusive videos from Lin-Manuel Miranda. With content created and managed directly by HAMILTON's editorial staff, the Hamilton app is the one-stop shop for all of the most exciting Hamilton news. This is just the beginning! 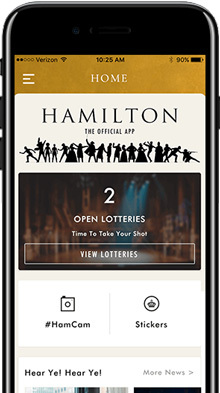 The Hamilton app will be updated frequently with new, exciting features for our fans. Upcoming features will include exclusive ticket access, augmented reality, an enhanced #EduHam experience, and interactive karaoke tracks. With book, music and lyrics by Lin-Manuel Miranda, direction by Thomas Kail, choreography by Andy Blankenbuehler, music direction/orchestrations by Alex Lacamoire, HAMILTON is based on Ron Chernow's biography of Founding Father Alexander Hamilton. The musical won eleven 2016 Tony Awards including Best Musical, Score, Book of a Musical, Direction of a Musical, Choreography and Orchestrations. Mr. Miranda received the Pulitzer Prize for Drama for HAMILTON. HAMILTON is the story of America's Founding Father Alexander Hamilton, an immigrant from the West Indies who became George Washington's right-hand man during the Revolutionary War, and was the new nation's first Treasury Secretary. Featuring a score that blends hip-hop, jazz, blues, rap, R&B and Broadway, HAMILTON is the story of America then, told by America now. For tickets and more information, visit our Hamilton page.